Our parent organization, US SAILING, was designated by the US Congress under the Congressional Amateur Sports Act of 1978, as the National Governing Body (NGB) of the sport of sailing. Headquartered in Bristol, Rhode Island, their efforts for the past 125 years have been to grow and support the sport of sailing with a mission to increase sailing participation and excellence through education, competition and equal opportunity, while upholding the principles of fair play, sportsmanship and safety. Closer to home on our treasured coasts, a handful of dedicated sailors committed to the development of a community sailing center in Martin County and was granted a charter from US SAILING. Bolstered with the endorsement of US SAILING, the United States Sailing Center – Martin County, opened for business in 1992 on the shores of the old Jensen Beach Causeway with a tent, camper and a few donated boats. The facility became designated by the United States Sailing Association as a US Sailing Center. This honor recognizes that USSCMC exceeds all the required standards set forth by U.S. Sailing and maintains an impressive commitment to high quality public access to sailing through our educational resources and trained staff. 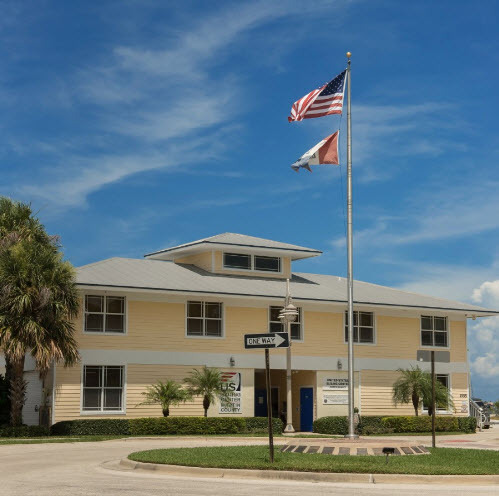 The member based Sailing Center moved in 2002 to a two-story waterside facility with unparalleled views of the water on Indian River Drive. Over the last 25 years, the fleet of OPTIs, O’Pen Bics, Lasers, Flying Scots, Hartleys, 420’s, Hobie Catamarans, Kayaks, Windsurfers and Paddleboards have expanded exponentially, and the USSCMC hosts large-scale elite events like Junior Olympics on an annual basis. The USSCMC is constantly striving to create affordable programs and build partnerships to ensure sailing is, and will continue to be, accessible to all. The USSCMC offers learn to sail programs, educational instruction with certifications, summer camps, support for middle and high school sailing programs, community support, racing programs, and competitions. USSCMC could not achieve its mission without the ongoing support its members and dedicated volunteers and US SAILING. Our members have a shared passion for this lifelong sport, and for sharing their passion with others. Part of US Sailing’s vision is to make sailing accessible for all with the certainty that everyone has a chance to learn or compete in a safe, fun, high-quality environment. 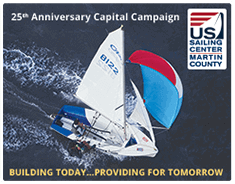 The US SAILING Center (USSCMC) and the US SAILING Foundation of Martin County are 501(c)(3) non-profit organizations with the mission of offering sailing programs for sailors and those who would become sailors of all ages and providing the funding required to sustain that mission.